We handle any case where a person has been victimized. See our "Practice Areas" page for a specific listing of the types of cases we handle on a regular basis. Here at Mick Levin, PLC, all initial consultations are free of charge. Negligence is the failure to use reasonable care that was a cause of a person's injury. It can consist of action or inaction. For example, if you are sitting in your vehicle and stopped at a stop light and someone slams their car into the back of your vehicle because they were texting while driving, they are negligent if the crash causes you an injury. Personal injury occurs when a party or several parties cause an injury of a personal nature to another party. Personal injury can be intentional such as when one person punches another. It can be negligent such as when a doctor accidentally leaves a sponge inside a patient. It can be non-physical, for example when someone calls a person sexually promiscuous without any evidence. It can be professional, for example when one business smears another business. Personal injury covers any injury that one party may cause to another. 3) the insurer failed to perform a reasonable investigation or evaluation to determine whether its action was supported by a reasonable basis. In order to constitute a reasonable investigation or evaluation, an insurer must give as much consideration to its insured's interests in being covered for the loss as it does to its own interests in making a profit. So no putting profits above claimants. 4) The police report number. Remember, your life and health are much more important than any legal case, so look after yourself first and your case second. Arizona has a number of different laws governing the "statute of limitations", when a lawsuit must be filed to preserve a victim's rights to compensation. Some cases require that a claim be filed in as short as 180 days after the victim was injured. Other claims do not have to be filed until two years after the injury. A good lawyer can advise you as to the appropriate statute of limitations for your particular case. You have the right to obtain emergency medical treatment - whether you have health insurance or not. You also have the right to report what occurred to police. After you are injured, you have the right to hire an attorney of your choosing and to seek compensation for your injuries. If you were injured in a vehicular collision, you have the right to have any body shop, not just the insurance company's preferred shops, repair the damage to your vehicle. There are other important rights every victim has but they vary from case to case. That is why it is important to obtain legal assistance as soon as you've been harmed. 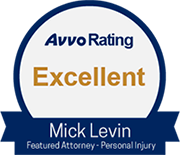 Attorneys, like the ones at Mick Levin, PLC, have experience handling cases like yours. A good attorney will assist you with getting your vehicle repaired (if you were injured in an automobile collision), refer you to medical providers, and have experience dealing with insurance companies. If the insurance company is giving you the run-around, a good attorney will know just how to get the insurance company to work for you, rather than against you. And if your case cannot be settled, a good attorney will go to court for you and guide you through the complicated legal process. It is always important to consult a lawyer if you have a case. Most lawyers, including the lawyers at Mick Levin, PLC, provide a free initial consultation. A lawyer will be able to tell you what they can do to help, even for small cases. Attorneys are there to help you. If you have already taken steps to resolve your case on your own, it is not too late to get help. Insurance companies exist to make their shareholders money. They make money by investing their policyholder's premiums and denying or underpaying claims. Insurance companies have a monetary incentive not to treat you fairly. If you believe that the insurance company isn't treating you fairly, you should hire an attorney to defend your rights. Insurance companies don't want you to get an attorney. It is easier for an insurance company to take advantage of you if you don't have anyone on your side who is familiar with the process. While hiring an attorney is not required, it is in your best interest to have someone who knows what they're doing on your side. In Arizona, you are entitled to a reasonable amount for your property damages, lost wages, medical bills, pain, suffering, disability, disfigurement, anxiety, and a reasonable amount to compensate you for the loss of enjoyment of life - that the participation in life's activities to the quality and extent normally enjoyed before the injury. Other damages may also apply depending on your unique circumstances. Until a jury comes back with an award and all the appeals are exhausted, a lawyer never knows the value of a claim. Those with experience, like the attorneys at Mick Levin, PLC, know the value of a case by having resolved similar cases and through years of experience. The biggest variables in the valuation of a claim are the nature and extent of the damages (see "What damages am I entitled to recover?" above), the amount of liability the responsible party or parties have, and the limits of available insurance or money to pay the value of the claim. For example, if you sustained life-threatening injuries caused solely by an uninsured motorist, there may not be any value of your claim unless you have uninsured motorist coverage. Conversely, if you sustained life-threatening injuries solely as the result of a motorist who has an unlimited amount of insurance (for instance, the United States Government), your claim could be worth a lot of money. A lawsuit is a formal complaint filed in a court of law - in these types of cases usually the victim files a lawsuit against the responsible party or parties. This starts the litigation process. While many lawsuits are settled or dismissed after the filing of a lawsuit, a lawsuit seeks a trial of the issues before a judge and jury. Lawsuits are filed on behalf of victims when the victim and the responsible party or parties cannot agree on a reasonable amount to compensate the victim. If the case is not settled or dismissed along the way, a jury will decide the amount of compensation at a trial. 99% of all lawsuits are settled or dismissed before trial. Your case may be part of that 99% or it may be part of the 1%. Many cases are settled without a lawsuit ever having to be filed. Many more cases are settled after a lawsuit is filed and before a trial. A good attorney can help you even if you don't want to go to court. Every lawsuit is unique. Some may resolve in a very short amount of time, some take years to resolve. Obviously, the more complicated and serious your case is, the longer it will take. Simpler cases tend to resolve quicker. Right now, it takes about three years, on average, for a case to get to trial from the date of filing. When you first meet with a lawyer, bring with you all of the paperwork and physical evidence you have pertaining to the reason for meeting with the lawyer. If you were injured, bring a list of your medical providers and your health insurance card. If you were in a car crash, bring photographs of your vehicle, the police report (or accident exchange card), and your car insurance card. If your case is about a potentially dangerous drug, bring the bottle, the pills, and everything you have about the drug. If you or your loved one were abused, bring any reports or evidence that you may have. When in doubt about whether to bring something, bring it anyways. A good lawyer can never have enough information and evidence about a case. You should also be prepared to take some notes in case the lawyer wants you to get additional information. The information that you provide an attorney may be kept confidential if you wish it to be. An attorney may divulge information, with your consent, to further the purpose of the representation. For example, if you tell an attorney how the injury affected your life, they will probably divulge that information to assist in getting you a better settlement. If, on the other hand, you tell an attorney information that would not help your case or that you do not want shared with anyone, the attorney is bound by the attorney-client privilege and the attorney's ethical rules not to divulge that information to anyone. Here at Mick Levin, PLC, if we accept your case, we will charge you what is a called a contingency fee. That means that we do not get paid unless we get a settlement of your case or collect on a judgment. The contingency fee is usually expressed as a percentage of what we collect for you. For simple cases that are settled without the need of filing a lawsuit, the contingency fee may be as low as 20%. For complex cases that go to trial or through an appeal process, the contingency fee may be as much as 40%. At Mick Levin, PLC, we advance all of the expenses of prosecuting your case, things such as filing fees, deposition fees, postage, photocopies, private investigators, and experts all cost money. We pay those fees out of our pocket on the condition that you reimburse us if we are successful in getting you a settlement or collecting on a judgment. The expenses are in addition to the attorney fees. Sometimes an attorney may ask for your consent to settle within a given range and will do so if the settlement offer is within that range, but an attorney should never settle a client's case without the client's consent. Once a settlement is reached, the lawyers will need some paperwork finalized. This usually takes a week or two to do. After the paperwork is finalized, the responsible party or parties will send a check to your lawyer. The check will cover both your amount and the lawyer's fees. The lawyer will have you sign the check and then deposit it into his trust account. A trust account is the State Bar of Arizona's account specifically for the purpose of holding a client's funds. Any interest accrued while being held in the trust account goes to special community projects run by the State Bar of Arizona. Once the funds clear the bank, usually after two weeks or so, the lawyer should have a check ready for you. The whole process can usually take 30 to 45 days - longer for larger settlement checks. In the United States, we have two primary legal systems: the criminal system and the civil system. The purpose of our civil law is to compensate the injured. The purpose of the criminal law is to punish the guilty. In very extreme circumstances, a civil jury may award punitive or exemplary damages, that is, money awarded to punish and deter the offender as well as those who may contemplate committing the same offense. Punitive or exemplary damages are usually awarded in civil cases against drunk drivers. It is possible to sue a county, city, state, tribal, and even the federal government. These kinds of cases all have unique requirements that sometimes trap the unwary. A good lawyer with experience with these types of claims, like the ones at Mick Levin, PLC, comes in handy when dealing with governmental entities. Depositions - statements given while under oath - are an opportunity for the attorney of the opposing side to ask you questions about you and your case. Most depositions focus on your background, such as where you were born and where you live, and the events that give rise to the lawsuit. If your case stems from an injury you sustained, there will likely be a lot of medical questions about your past, current, and anticipated future medical treatment. A good lawyer should be able to advise you as to the questions you may expect to receive during your deposition. 3) have an attorney look it over to make sure you aren't signing away something you don't mean to. Insurance companies had lawyers draft that release, so likewise you should have a lawyer review it on your behalf. Yes. In Arizona, juries are not permitted to consider health insurance in reaching their verdicts. Health insurance, or the lack thereof, is immaterial to the injury caused to a victim. Yes. Certain state and federal laws permit a health insurer to make a claim against your settlement. Health insurer claims against settlements, sometimes referred to as liens, are hotly contested. A good lawyer should negotiate with your health insurer to pay them the least amount of money possible and maximize the amount of money you get from your settlement. Yes. In Arizona, we compare the fault of all the parties responsible for a person's injury. For example, if you were 30% at fault and another party was 70% at fault for your injuries, then you would receive 70% of the total amount of damages the jury believes you sustained. "Full coverage" doesn't really mean what it sounds like. To an insurance agent, a person with full coverage has liability insurance coverage that complies with Arizona's state minimum requirements. A person who asks for "full coverage" is only going to get the bare minimum insurance. That is why it is important to go through each different kind of insurance with your insurance agent, make sure you understand it, and decide for yourself if it is right for you. A good lawyer can also give you some good advice as to the types of coverage available and what is covered. For example, the state minimum liability coverage in Arizona is currently $15,000.00 per person with a maximum of $30,000.00 per incident. This coverage only covers a person you harm. If you want coverage that covers you and your family if you are involved in a collision that is not your fault, you need to purchase uninsured ("UM") and underinsured ("UIM") coverage. These might cost you a little bit more, but they cover you and your family's lost wages, disability, disfigurement, medical bills, pain, and suffering. Additionally, if you have health insurance, you may not need medical payments coverage, but if your plan has a high deductible for emergency rooms, hospitals, and radiology tests (like MRIs and CT scans), it could help cover that expense. Talk to a lawyer or your insurance agent for more advice on insurance coverages available to you. Most civil injury cases require a finding of negligence. A good attorney can hire an investigator to find witnesses or hire an expert to support your claim of negligence. In product liability cases, that is where there is a defect in a product that causes a person an injury, no finding of negligence is required. A personal injury case is "personal" to the person suffering the injury. When the injured party dies, their personal injury case dies with them. If the injury was a cause of the death of a person, their survivors may have a wrongful death claim. In Arizona, the parents, spouse, children, and estate of someone who died may bring a wrongful death claim.